The number of Christian teenagers actively sharing their faith is declining. Believing teenagers were asked if they had attempted to explain their religious beliefs to someone else with different religious beliefs with a hope that they might receive Jesus Christ as Savior. 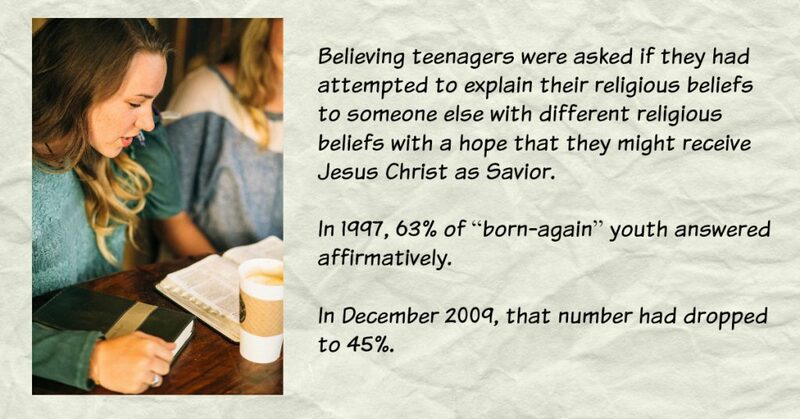 In 1997, 63% of “born-again” youth answered affirmatively. In December 2009, that number had dropped to 45%. The study suggests a significant decline in believing teens attempts to witness. Teenagers are consistently among the most religiously active Americans, with nearly six out of every 10 teens engaged in some type of group spiritual activity in a typical week. Yet, the spirituality of teenagers is also remarkably diverse and fluid. . . . .
Kinnaman noted: “Christian teenagers are taking cues from a culture that has made it unpopular to make bold assertions about faith or be too aggressively evangelistic. Yet fewer young Christians apparently believe it is worthwhile to talk about their faith in Jesus with others. Among 13- to 17-year-old Protestants, there are actually signs of increased religious activity: they are more likely to pray, go to worship services, read the Bible and attend youth group meetings than were Protestant-affiliated teens a dozen years ago. What does this suggest for youth pastors who may still see lots of activity and high attendance? 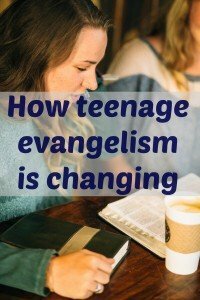 Are there forms of evangelism training that can help your teens share their faith in a way that is natural and normal? Perhaps part of their aversion is with some of the models and forms that have been handed down from previous generations. I did youth ministry for 15 years in at least 3 different churches. I intentionally provided evangelism training every year for these students. I helped them learn non-obnoxious conversational ways of doing evangelism in cooperation with the Holy Spirit. How to find the passionate foundation of your faith so that sharing is natural. How to notice the right time to have spiritual conversation that helps others in their journey towards Christ. What stories to tell and how to tell them. Read more clicking on the banner below.